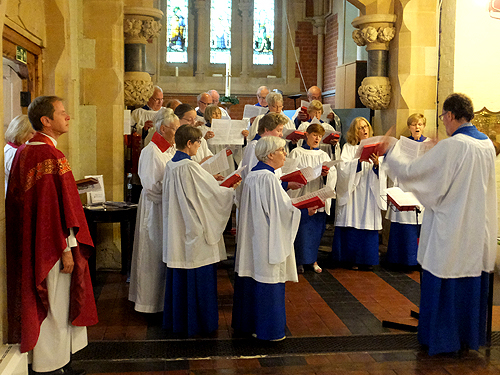 The church choir supports the congregation regularly, though not every week, at Parish Communion services. In addition to the hymns, it sings at least one anthem, usually during the administration of Holy Communion and occasionally an introit. When the choir is singing in a service, the members process in with the clergy and servers (see below) and then sit in the choir stalls in the chancel. 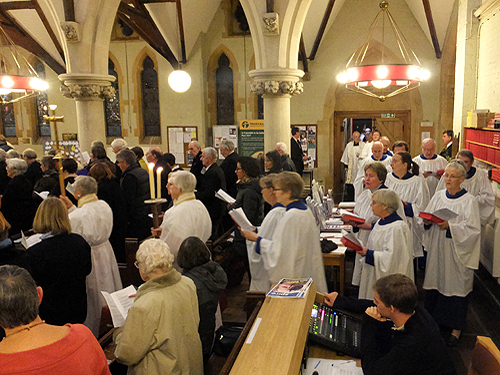 The choir also leads the singing in the traditional Carol Service and takes part in many special services throughout the year, helping to celebrate Advent, Christmas, Lent, Easter, and other important milestones in the Church Year. There are occasional special Sunday evensongs, both in St James’s and also elsewhere. The choir consists of soprano, alto, tenor and bass voices and both adults and children can be members, although currently there are no children. There is a mixture of choral and musical levels of experience within the choir. A variety of music is performed, from the Renaissance period onwards, much from the New Church Anthem Book, some a cappella and some accompanied. New singers in all voices, who are able to read music, are always welcome – please check with the organist/choirmaster first. Choir members show a good deal of regular commitment, especially on cold, wet winter evenings, or equally on warm, sunny summer ones! Generally rehearsals are held on two Friday evenings a month from 19.00 to 20.00, more preceding major services, such as those during Holy Week and the Carol Service. They are held in the church and are sometimes followed by drinks and socialising at different members' homes.